Do you want your smile to win many hearts? Is an evergreen sparkling smile your dream? Even if you are not gifted with the perfect set of teeth, there is nothing to worry about. Because science is there to help you. Cosmetic Dentistry is an ideal solution for an evergreen sparkling smile. It is the technique to eliminate flaws from your teeth with several treatments. 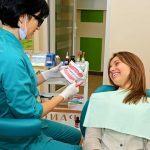 These treatments include teeth whitening, caps, bridges, orthodontics, white fillings, and veneers or laminates, as they are commonly known. Cosmetic dentistry may also be referred to as smile makeover. Mumbai is the hub of cosmetic dentistry clinics. The teams at these specialized centres are endeavored to offer best services and solutions to the people searching for that perfect smile. So you can’t wait to know what these top clinics are, can you? Then why the delay? Sit back and read on! This is a modern dental clinic in Mumbai run by Dr. Sandeep Khanna. This ISO 9001:2008 clinic provides all types of dental treatments. They have multiple branches across Mumbai. They offer their services with life time warranty as assurance. This is a popular clinic for cosmetic dentistry that is located at Peddar Road. It has sophisticated technologies and requisite amenities for world class treatments. They offer nitrous oxide dentistry along with mercury free tooth colored fillings. They offer cosmetic dentistry treatments in the hospital premises. They have specialists in this field to offer excellent patient services. The hospital has the latest state of the art equipment and facilities for the same. Praxis is a well-known and the best cosmetic clinic in Mumbai. They offer a complete range of services for a dental makeover. Their services include ceramic crowns, veneers, gum corrections, and dental implants. It is the only dental centre of India with world class quality certification of OHSAS: 18001 2007. Their clientele includes famous movie stars and head honchos of corporate houses. They offer all clinical services for cosmetic dentistry. Visit this clinic for professional services in cosmetic dental treatments. The panel of dentists at this clinic is well qualified and proficient in cosmetic dental surgeries. They also offer aesthetic crowns and bridges with other cosmetic dentistry treatments. This clinic in Mumbai has highly specialized services offered by Dr. Jyoti Narla. It has sophisticated treatment facilities for procedures like aesthetic dentistry, smile design, teeth straightening, etc. This clinic, located in West Malad, offers comprehensive services in the field of cosmetic and aesthetic dentistry. Their range of services includes aesthetic crown and bridges, smile designing, teeth reshaping, wedding smile services, etc. This clinic in Andheri offers aesthetic dentistry services. Dr. Monica Kapoor is a leading cosmetic surgeon with degrees in cosmetology and diploma in cosmetic dentistry. The clinic has some of the most famous personalities including actors, models, and television stars visiting the clinic for a smile makeover. This cosmetic dental clinic in Mumbai offers specialist services. They have a team of well qualified and experienced doctors who offer you services like smile design, tooth colored fillings, etc. These are the leading cosmetic clinics in Mumbai. For a flawless and radiant smile, visit any of these cosmetic dentistry Mumbai clinics and see the difference they can make to your personality. Of course, your smile matters more than anything else in this world, right?